This embroidery was inspired by my many hours of swimming up and down in a beautiful Lido pool on Jesus Green in Cambridge. I love being in water and feeling it move against my skin. I wanted some of that delight to appear in my work. The pool is very long (100 yards) and is surrounded by tall trees, which cast shadows across the water. The pool had also been painted in patches, so the colours change all the time as you swim. 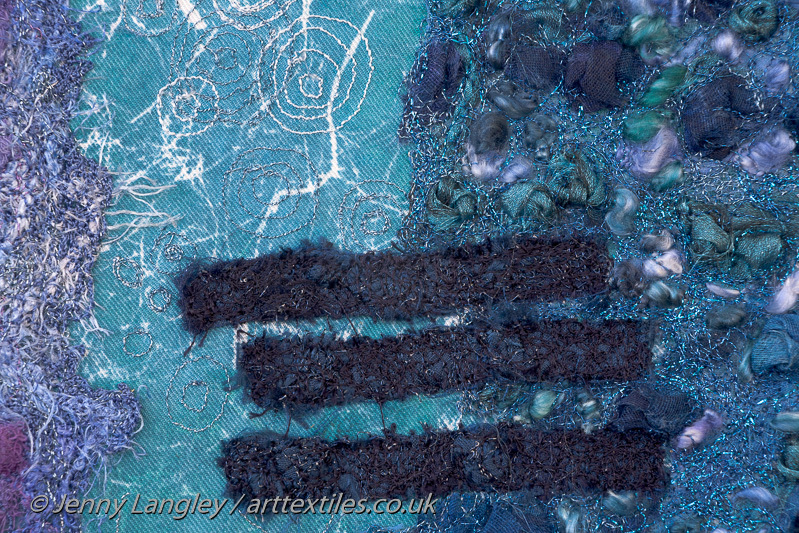 It is so beautiful when sunlight plays on the rippling water, so I've added printed marks and stitches which sparkle, suggesting the constantly moving patterning of sunlight in the water. The dark lines represent the steps into the pool, and there also are some concentric rings, the only evidence that I have swum by.